P1133. 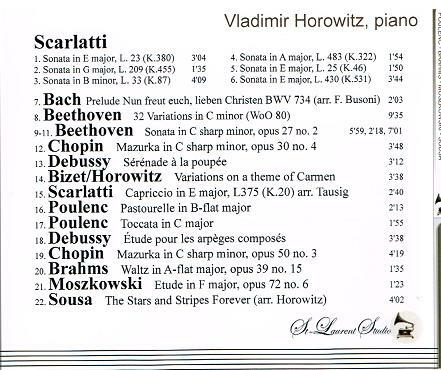 VLADIMIR HOROWITZ: Bach, Scarlatti, Beethoven, Chopin, Brahms, Debussy, Poulenc, Moskowski, Bizet & Sousa Recital. (Canada) St Laurent Studio YSL 78-239, recorded 1928-50. Transfers by Yves St Laurent. 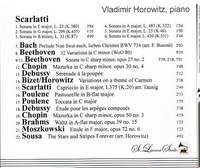 Into Mr. Horowitz's late 70s and early 80s - when he made a heavily publicized and carefully orchestrated comeback in the concert world - he retained the ability to extract colors of either extraordinary brilliance or extraordinary delicacy. 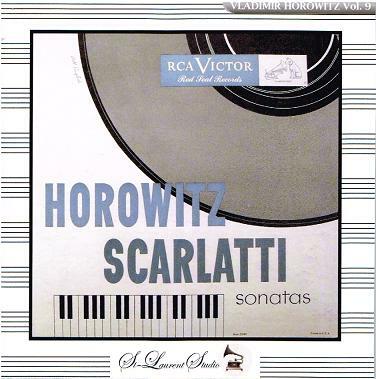 In his concert appearances during the 1920's and 30's, Mr. Horowitz's ability to create excitement in whatever he did on stage made him an almost mythical figure - a status only enlarged by his personal eccentricities and flair for attracting public attention.